Bankim Chandra Chatterjee was born on 27th June 1838 in the village Kantalpara of the Twenty-four Paraganas District of Bengal. 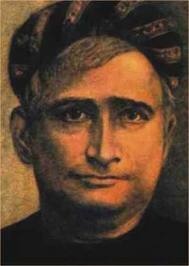 Bankim Chandra Chattopadhyay ( (27 June 1838 – 8 April 1894) was a Bengali writer, poet and journalist. He was the composer of India’s national song Vande Mataram, originally a Bengali and Sanskrit stotra personifying India as a mother goddess and inspiring the activists during the Indian Freedom Movement. Bankim Chandra wrote 13 novels and several ‘serious, serio-comic, satirical, scientific and critical treaties’ in Bengali. His works were widely translated into other regional languages of India as well as in English. Bankim Chandra was born to an orthodox Brahmin family at Kanthalpara, North 24 Parganas. He was educated at Hoogly College and Presidency College, Calcutta. He was one of the first graduates of the University of Calcutta. From 1858, until his retirement in 1891, he served as a deputy magistrate and deputy collector in the Government of British India. Bankim Chandra is widely regarded as a key figure in literary renaissance of Bengal as well as India. Some of his writings, including novels, essays and commentaries, were a breakaway from traditional verse-oriented Indian writings, and provided an inspiration for authors across India. When Bipin Chandra Pal decided to start a patriotic journal in August 1906, he named it Vande Mataram, after Bankim Chandra’s song. Lala Lajpat Rai also published a journal of the same name.